Lee 3D is a 3D printing bureau specialising in colour 3D printing and 3D printing for architecture. Full colour 3D printing allows the creation of high quality pieces for use in marketing, exhibition and educational purposes. The process allows textured digital models to be made into physical form. Digital models can be created by designers and artists or can be derived from a number of different 3D scanning processes. Best results are a combination of preparing the software model for printing, good setting up of the printers, thorough cleaning up of the printed model and careful infiltration of the part. Diligent attention to detail through this process leads to best quality colour output. At Lee 3D we focus on producing the best colour work we can. As with all printing it is important to check colour output with what you see on your computer screen. Where time allows, we recommend printing test samples to confirm colour accuracy. Architectural design models help communicate ideas to clients, planners and stakeholders more widely. At Lee 3D we seek to build long term relationships with architects and designers. Established relationships increase productivity and underpin improved service. We are well equipped to deal with the specific challenges presented by 3D printing for architecture. The main challenges being data preparation, timescales and cost. 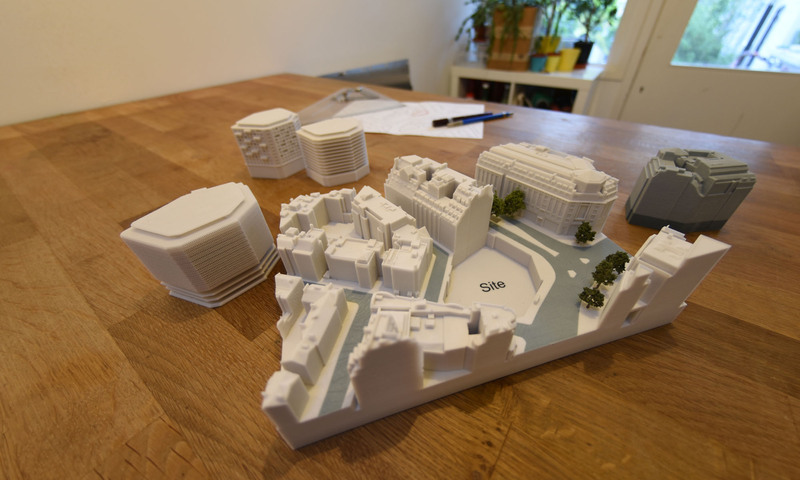 Architectural data is typically modelled in SketchUp, Rhino, Revit, Microstation and AutoCad, each of these applications has strengths and weaknesses when it comes to 3D printing and all architectural design data is subject to scaling issues. We use Magics software from Materialise to prepare data for printing architectural design models. 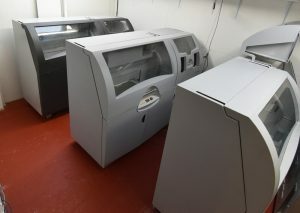 We run three ProJet 660/ZPrinter 650 printers. These machines have a build volumes of 380 x 250 x 200(z)mm. This allows us to produce large jobs and quick turnaround work when required. Lee 3D full colour 3D printers. The cost of 3D printing is based on the amount of material used. Changing scale has a significant impact on cost so we work with clients to select scales that will fit budgets while still communicating the information required. To keep costs down we hollow models when possible to reduce the amount of material used. Remember, automated online quoting systems will not include hollowing models. We do this extra work to keep costs down and thereby encourage greater use of 3D printing. For further information on the relationship between size, scale and cost visit Optimising size and cost for 3D printing architectural design models.